China's young hoops hopefuls got a little taste of the big time during the Chinese Basketball Association's All-Star Weekend in Qingdao. Children from Mengjiazhuang Primary School in Hebei province and the Laoshan district of Qingdao won waves of applause as they displayed their skills during an exhibition game designed to showcase the progress made by the CBA's mini-basketball development plan, the brainchild of CBA chairman Yao Ming. 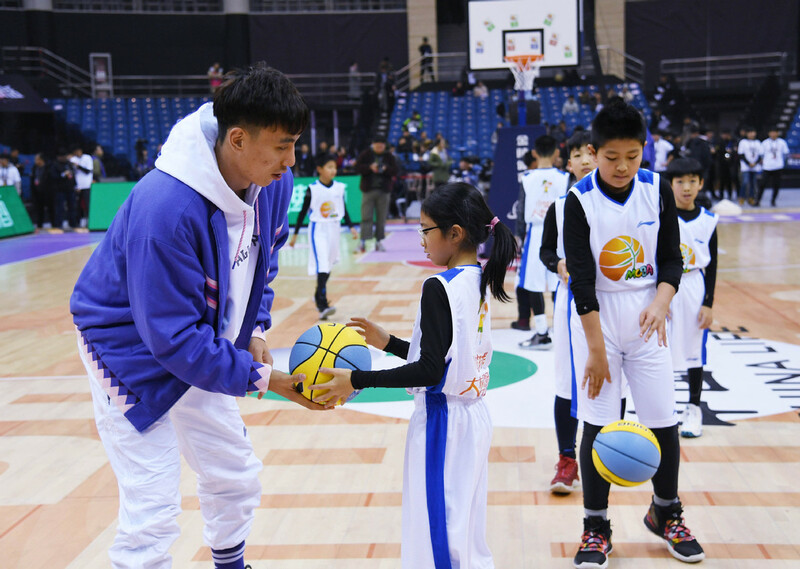 Three of the league's big-hearted All-Stars - Shandong's Tao Hanlin, Tianjin's Shi Deshuai and Zhejiang's Wu Qian - lent a helping hand, overseeing instruction in dribbling, passing and shooting for the pupils before the game. "This exhibition game is the CBA's big hand holding mini-basketball's little hand," CBA secretary-general Bai Xilin told Xinhua. "A mature and high level sport event accelerates the development of youth basketball and strengthens the foundations of Chinese basketball. This is key to our reform." The CBA has spared no effort in promoting kids' hoops since it started the program in November 2017, including operating a new match system using smaller basketballs. Since March 2018, the Mini-Basketball League has attracted around 100,000 players and 9,700 coaches from 15,000 teams in more than 100 cities. The training of coaches, implementation of technical standards and a multitude of weekend training camps is also boosting the initiative. Aside from the program nurturing new talent, Yao is pleased to see it enriching the lives of kids. "We will continue to discuss ways in which we can merge sports and education, as they both play important roles in helping people grow up," Yao said. Since 2017, Chinese University Basketball Association (CUBA) players have participated in the All-Star Weekend, and this year they produced a shock by defeating the CBA's rookie stars 90-88 in the All-Star Rookie Challenge. "Some rookie stars were downhearted after the game, but I don't think there was anything to be despondent about," said Bai. "In fact, it showed that we have made progress in integrating sports and education." Yao agreed, adding: "China's sports talents must be cultivated from schools in the future." For the moment, the NBA legend said he is working on facilitating direct connections between the CUBA and CBA leagues.